My mother in law asked me to make her a birthday card for her sister. She wanted a similar card that I had made for her for her birthday. 16x16 pearlised card cut to 9"
Barkley paper kit from crafters companion. 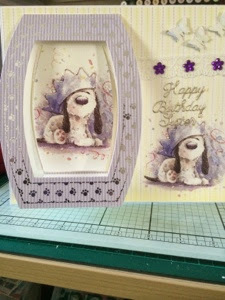 Gems, butterfly punch, and happy birthday sister dies are available from Franki craftytouch shop.